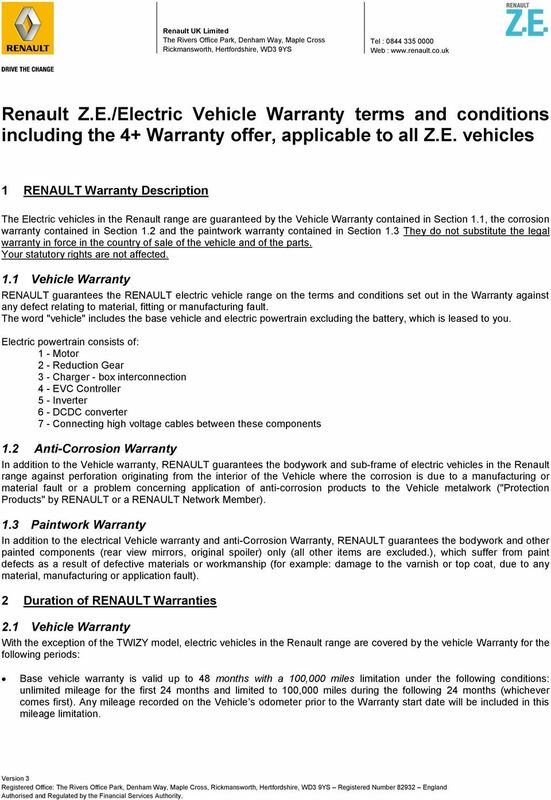 Download "Renault Z.E./Electric Vehicle Warranty terms and conditions including the 4+ Warranty offer, applicable to all Z.E. vehicles"
1 Renault Z.E./Electric Vehicle Warranty terms and conditions including the 4+ Warranty offer, applicable to all Z.E. vehicles 1 RENAULT Warranty Description The Electric vehicles in the Renault range are guaranteed by the Vehicle Warranty contained in Section 1.1, the corrosion warranty contained in Section 1.2 and the paintwork warranty contained in Section 1.3 They do not substitute the legal warranty in force in the country of sale of the vehicle and of the parts. Your statutory rights are not affected. 1.1 Vehicle Warranty RENAULT guarantees the RENAULT electric vehicle range on the terms and conditions set out in the Warranty against any defect relating to material, fitting or manufacturing fault. The word "vehicle" includes the base vehicle and electric powertrain excluding the battery, which is leased to you. Electric powertrain consists of: 1 - Motor 2 - Reduction Gear 3 - Charger - box interconnection 4 - EVC Controller 5 - Inverter 6 - DCDC converter 7 - Connecting high voltage cables between these components 1.2 Anti-Corrosion Warranty In addition to the Vehicle warranty, RENAULT guarantees the bodywork and sub-frame of electric vehicles in the Renault range against perforation originating from the interior of the Vehicle where the corrosion is due to a manufacturing or material fault or a problem concerning application of anti-corrosion products to the Vehicle metalwork ("Protection Products" by RENAULT or a RENAULT Network Member). 1.3 Paintwork Warranty In addition to the electrical Vehicle warranty and anti-corrosion Warranty, RENAULT guarantees the bodywork and other painted components (rear view mirrors, original spoiler) only (all other items are excluded. ), which suffer from paint defects as a result of defective materials or workmanship (for example: damage to the varnish or top coat, due to any material, manufacturing or application fault). 2 Duration of RENAULT Warranties 2.1 Vehicle Warranty With the exception of the TWIZY model, electric vehicles in the Renault range are covered by the vehicle Warranty for the following periods: Base vehicle warranty is valid up to 48 months with a 100,000 miles limitation under the following conditions: unlimited mileage for the first 24 months and limited to 100,000 miles during the following 24 months (whichever comes first). Any mileage recorded on the Vehicle s odometer prior to the Warranty start date will be included in this mileage limitation. 3 2.4 I Range Battery Warranty As Traction batteries in i versions of ZOE and Kangoo are not covered under the terms of the lease, they are provided with a warranty which also includes a fixed period and mileage performance cover as follows: ZOE i": 5 years/60,000 miles (whichever comes first) 70% battery capacity. Kangoo Z.E. i": 5 years/60,000 miles (whichever comes first) 66% battery capacity. This means that if the traction battery drops below the above percentages of its original capacity within the stipulated time or mileage parameters, it will be repaired or replaced at RENAULT s option. 3 Starting date of RENAULT Warranty RENAULT Warranties are effective on the delivery date specified on the Warranty & Service Sheet that is provided to the customer upon delivery of the Vehicle. When the Vehicle is purchased through an intermediary, the warranty period starts the day the Vehicle is delivered to the intermediary. 4 Scope of Warranty 4.1 Base Vehicle Warranty Benefits to the customer: - These warranties cover the cost of repair or replacement of defective parts to repair a material, assembly or manufacturing defect recognized by the manufacturer when carried out by a member of the authorised RENAULT Dealer Network. It also covers consequential damage to the vehicle resulting from the principal defect. It is up to RENAULT, in consultation with the relevant RENAULT Dealer, to decide whether it is appropriate in the circumstances to repair or replace any faulty part. - A mobility offer under the conditions stated in the Section 7 Mobility - Breakdown assistance services 24 hours a day 7 days a week under the conditions stated in the "RENAULT Assistance" Section Anticorrosion Warranty The Anti-Corrosion Warranty covers repair or replacement of corroded parts of the Vehicle's bodywork and sub-frame subject to them being a result of a manufacturing defect that originates from the interior to exterior, a material fault, or the application of anti-corrosion products recommended by the manufacturer. It is the RENAULT workshop's responsibility to decide whether repair or replacement of these parts is required. The RENAULT workshop will inform the customer of this. 4.3 Paintwork Warranty The customer benefits from the free of charge repair or replacement of those elements demonstrating paintwork defects (e.g. topcoat damage due to a material defect, manufacture, or of its application) recognised by the manufacturer. 4 5 Geographic coverage The Warranty applies to any vehicle sold new in the United Kingdom as long as it is driven and remains registered in the following European countries: UNITED KINGDOM - ANDORRA - AUSTRIA - BELGIUM - DENMARK - FRANCE metropolitan - GERMANY - IRELAND - ITALY - LICHTENSTEIN - LUXEMBOURG - MONACO - NETHERLANDS - NORWAY - POLAND - PORTUGAL - ROMANIA - SANMARINO - SPAIN (except Ceuta and Melilla) - SWEDEN - SWITZERLAND For Zoe, the following countries are excluded:- NORWAY - POLAND - ROMANIA - SWEDEN If the vehicle is registered in one of the countries inside the geographic zone (detailed above) other than the United Kingdom, the warranty of the country of first registration will be applicable. If a Vehicle is likely to be principally used or registered outside the geographic zone detailed above, the Customer cannot benefit from the Warranty and the Warranty will be invalid. Outside the country of purchase, the Warranty will be valid under the same conditions as in the country of origin as long as the Vehicle is driven and remains registered within the geographic zone covered by the Warranty set out above. The Warranty applies to any members of the RENAULT NETWORK with RENAULT Z.E. signage and/or RENAULT Z.E. Service in these countries. 6 Roadside Assistance and additional services Roadside Assistance is offered by RENAULT Z.E. ASSISTANCE in the UK, which provides a comprehensive roadside package, available 24 hours a day, every day of the year. Duration of Renault Z.E. Assistance Renault Z.E products are entitled to Renault Z.E. Assistance for the period detailed in the battery lease contract with RCI. For the Zoe and Kangoo Z.E. i Range of vehicles, Renault Z.E. Assistance cover is provided for 48 months. Beneficiaries The customer, or the authorised driver, and all other occupants of the eligible vehicle up to the legal seating capacity of the vehicle (including the driver), benefit from assistance under the following conditions: RENAULT Z.E. ASSISTANCE only provides assistance in relation to an immobilization of the vehicle due to an unexpected mechanical, electrical or electronic defect covered by the Vehicle Warranty and recognised by the manufacturer and beyond the responsibility of the customer or the driver. What is not included? 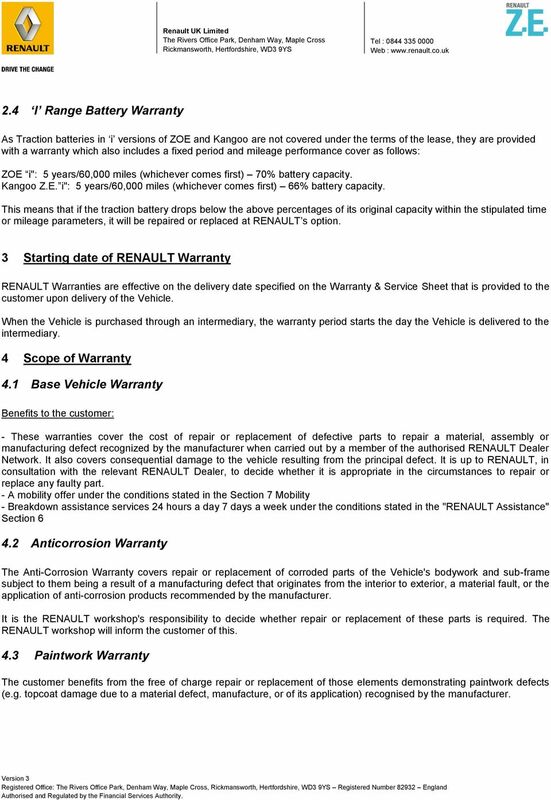 Non-Warranty Incidents While RENAULT Z.E. ASSISTANCE aims to provide you with peace of mind motoring, it only provides assistance for manufacturer based or mechanical faults on the Vehicle. It does not provide assistance for certain non-warranty incidents such as (but not limited to): The normal loss of energy from the vehicle battery is not covered as part of the Renault Z.E. 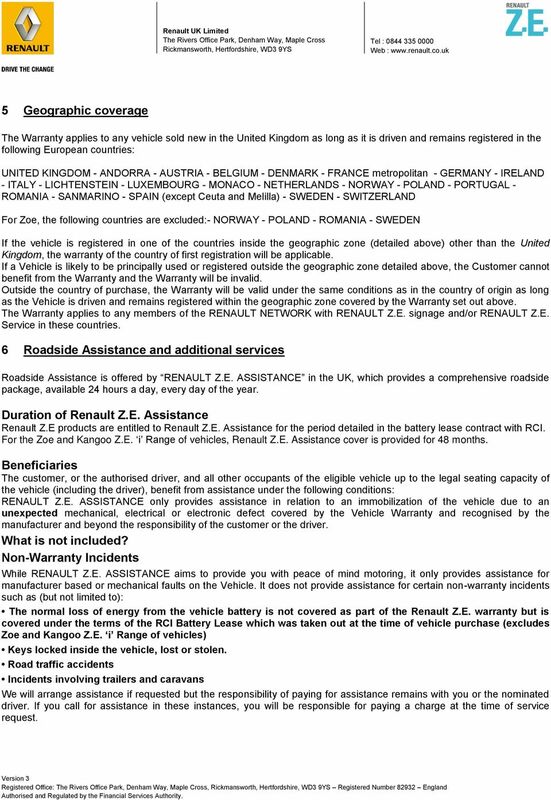 warranty but is covered under the terms of the RCI Battery Lease which was taken out at the time of vehicle purchase (excludes Zoe and Kangoo Z.E. i Range of vehicles) Keys locked inside the vehicle, lost or stolen. Road traffic accidents Incidents involving trailers and caravans We will arrange assistance if requested but the responsibility of paying for assistance remains with you or the nominated driver. If you call for assistance in these instances, you will be responsible for paying a charge at the time of service request. 6 for overnight accommodation for the customer and his passengers for up to 3 nights in a hotel selected by Renault Z.E. Assistance. Any additional costs (other than breakfast), such as meals, drinks, telephone calls and newspapers are not covered and must be settled by the customer. d) Alternative travel arrangements - or - e) home return (these services are not cumulative with one another or with accommodation) If the customer does not wish to wait for the repairs of the vehicle, RENAULT Z.E. ASSISTANCE will arrange and support the costs for the most direct onward travel: rail air (economy) if the travel by train is longer than 8 hours, boat taxi, up to 100 miles any other appropriate and locally available transportation means. 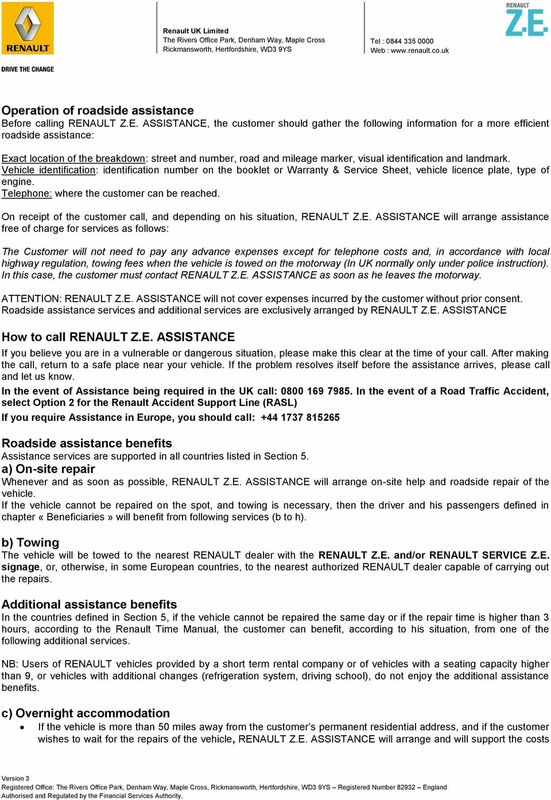 e) Collection of the repaired vehicle (this service is cumulative with the previous ones) In order to collect the vehicle after repairs, RENAULT Z.E. ASSISTANCE will arrange and support the costs for one of the means described in the paragraph entitled Alternative travel arrangements or Home return for the customer or for a person designated by him. f) Replacement vehicle (this service is not cumulative with the previous ones) If the vehicle cannot be repaired the same day or if the repair time is higher than 3 hours, according to Renault Time Manual, the customer can benefit from a replacement vehicle free of charge up to 3 days, provided by Renault, subject to local availabilities. See details about providing the replacement vehicle in the Mobility Section. g) Connection costs RENAULT Z.E. ASSISTANCE will assist with all the connecting costs between stations, airports, hotels, home address and vehicle repairs location. h) Tyre Cover Assistance in the event of a flat tyre or puncture is included in your Renault Z.E. Assistance cover. If your vehicle has a spare wheel, the wheel will be changed for you. If your vehicle does not come with a spare wheel, an authorized tyre fitter will be sent to attempt to repair the tyre at the roadside. If a repair is not possible, they will arrange for a replacement tyre (at the customer s expense) to be delivered to the location of the incident which they will then fit to your vehicle. If a roadside repair is not possible, your vehicle will be recovered to a place of your choosing. All costs associated with the purchase and fitment of the tyre will be the responsibility of the driver. 7 Mobility In addition to the benefits covered by Section 6 g), the customer may also receive a courtesy vehicle, if a fault occurs which is covered by the vehicle warranty, not resulting in immobilization of the vehicle but requiring repair, on appointment, requiring more than three (3) hours according to the Renault Time Manual, provided that the fault or breakdown is not the result of an accident. The Customer must arrange an appointment at least 48 hours before the scheduled repair, in order to allow the network with RENAULT Z.E. signage and / or RENAULT Z.E. SERVICE to ensure the availability of a courtesy vehicle. Customers must specifically request a courtesy car when making appointments in the network with RENAULT Z.E. signage and / or RENAULT Z.E. SERVICE. The courtesy car will be available to the client during the downtime of the vehicle and may not exceed three days. The vehicle will be offered to the customer according to local availability. The use of the courtesy vehicle will be subject to the terms and conditions of the hire car policy. 7 The vehicle must imperatively be returned to the place where it was loaned. The additional costs such as additional insurance, tolls or fuel shall be borne by the customer. Vehicles that have been subject to further adjustments (refrigerated vehicle, driving school, taxi,...) as well as short-term rental vehicles and vehicles of more than 9 seats do not benefit from the provision of a courtesy vehicle. 8 Limitations and exclusions of the Renault Warranty The Renault Warranty does not cover: - The indirect consequences of any fault (including but not limited to loss of business, length of time off the road) - Any components of the Vehicle that have been changed following the Delivery Date and the consequences (including but not limited to damage, premature wear, alterations) of such changes on other parts or components of the Vehicle or on the Vehicle's specifications - Any routine servicing agreed by the Customer or which the Customer chooses to undertake, even though it conforms to the manufacturer s recommendation. - The replacement of parts damaged as a result of normal wear and tear. This includes (but is not limited to) items such as brake and clutch friction materials, wiper blades and trim. However, such items are covered if replacement is required as a result of manufacturing or material defect. - The damage resulting from poor Vehicle maintenance, especially when any instructions concerning the treatment, servicing frequency or care to be taken with regard to the Vehicle detailed on the Warranty & Service Sheet or in the Owner's Handbook, have not been observed. - Replacement or extra supplies of liquids (such as coolant, washer fluid, cooling fluid) under the use or maintenance of the vehicle. - The Damage resulting from usage conditions of the Vehicle which do not conform to those stated in the Owner's Handbook, the Vehicle's Warranty & Service Sheet and these Warranty Terms and Conditions (for example: overloading, or the vehicle has been entered in any sort of sporting competition). 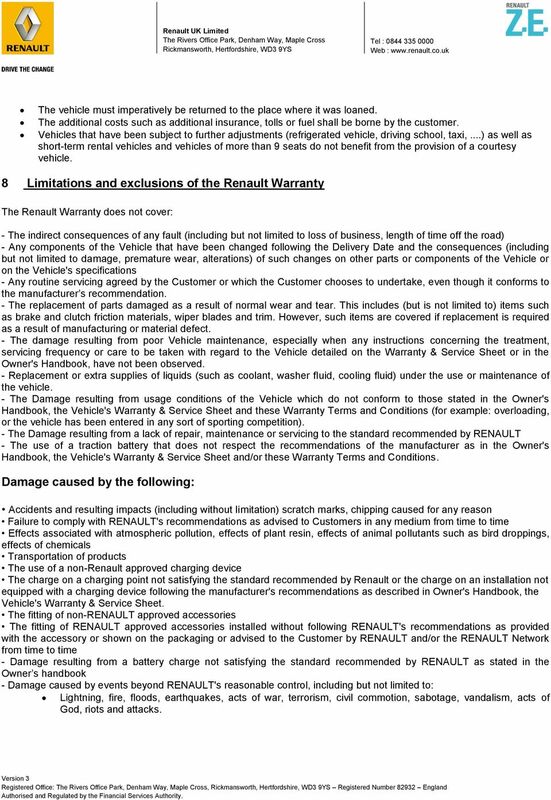 - The Damage resulting from a lack of repair, maintenance or servicing to the standard recommended by RENAULT - The use of a traction battery that does not respect the recommendations of the manufacturer as in the Owner's Handbook, the Vehicle's Warranty & Service Sheet and/or these Warranty Terms and Conditions. Damage caused by the following: Accidents and resulting impacts (including without limitation) scratch marks, chipping caused for any reason Failure to comply with RENAULT's recommendations as advised to Customers in any medium from time to time Effects associated with atmospheric pollution, effects of plant resin, effects of animal pollutants such as bird droppings, effects of chemicals Transportation of products The use of a non-renault approved charging device The charge on a charging point not satisfying the standard recommended by Renault or the charge on an installation not equipped with a charging device following the manufacturer's recommendations as described in Owner's Handbook, the Vehicle's Warranty & Service Sheet. The fitting of non-renault approved accessories The fitting of RENAULT approved accessories installed without following RENAULT's recommendations as provided with the accessory or shown on the packaging or advised to the Customer by RENAULT and/or the RENAULT Network from time to time - Damage resulting from a battery charge not satisfying the standard recommended by RENAULT as stated in the Owner s handbook - Damage caused by events beyond RENAULT's reasonable control, including but not limited to: Lightning, fire, floods, earthquakes, acts of war, terrorism, civil commotion, sabotage, vandalism, acts of God, riots and attacks. 8 In addition to the above limitations and exclusions, the Renault Warranty on the battery for i" range of Zoe and Kangoo Z.E. vehicles does not cover: - any damage or fault caused by failure to comply with the Manufacturer s recommendations in the use, charging, storage and servicing of the vehicle; - any damage or fault caused by failure to repair the Electric Vehicle and/or battery, further to detection of an issue; - any modifications which are made to a battery by the Customer; - any damage or fault from external causes, such as accidents, theft, arson, hail, windstorm, lighting, frost, consequences related to atmosphere phenomena, in particular industrial fall-out, acid or alkali contamination, loose chippings. 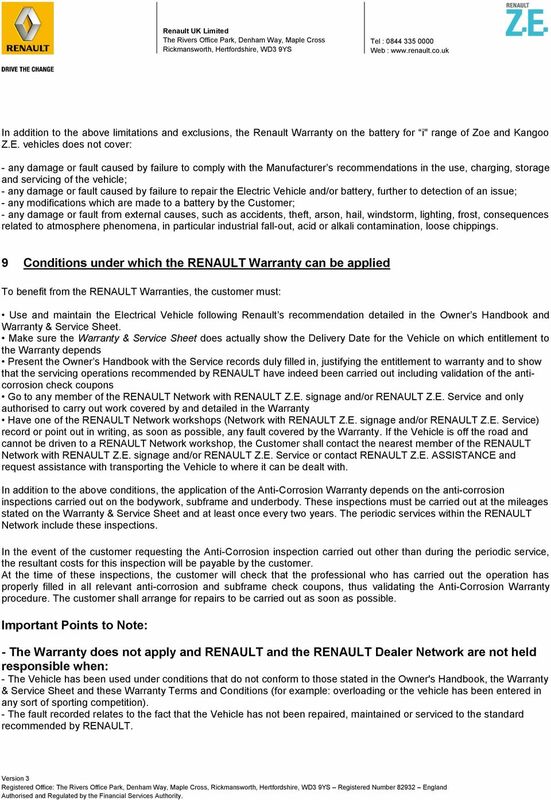 9 Conditions under which the RENAULT Warranty can be applied To benefit from the RENAULT Warranties, the customer must: Use and maintain the Electrical Vehicle following Renault s recommendation detailed in the Owner s Handbook and Warranty & Service Sheet. 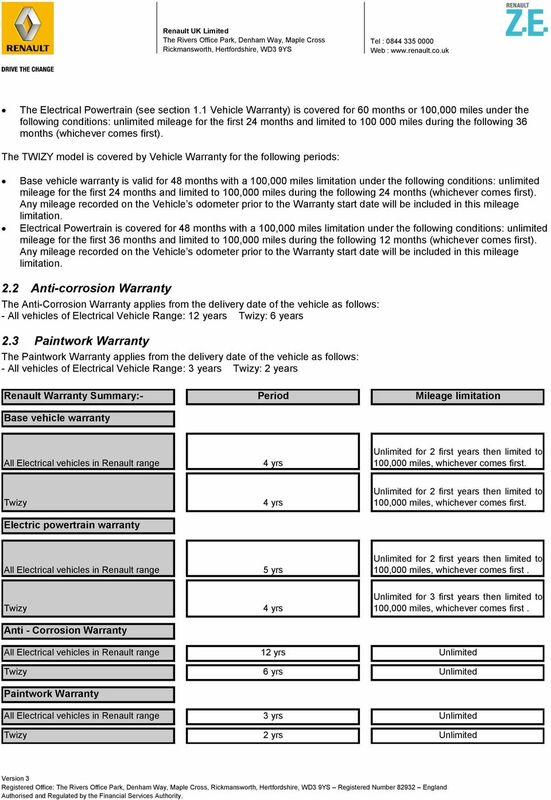 Make sure the Warranty & Service Sheet does actually show the Delivery Date for the Vehicle on which entitlement to the Warranty depends Present the Owner s Handbook with the Service records duly filled in, justifying the entitlement to warranty and to show that the servicing operations recommended by RENAULT have indeed been carried out including validation of the anticorrosion check coupons Go to any member of the RENAULT Network with RENAULT Z.E. signage and/or RENAULT Z.E. Service and only authorised to carry out work covered by and detailed in the Warranty Have one of the RENAULT Network workshops (Network with RENAULT Z.E. signage and/or RENAULT Z.E. Service) record or point out in writing, as soon as possible, any fault covered by the Warranty. If the Vehicle is off the road and cannot be driven to a RENAULT Network workshop, the Customer shall contact the nearest member of the RENAULT Network with RENAULT Z.E. signage and/or RENAULT Z.E. Service or contact RENAULT Z.E. ASSISTANCE and request assistance with transporting the Vehicle to where it can be dealt with. In addition to the above conditions, the application of the Anti-Corrosion Warranty depends on the anti-corrosion inspections carried out on the bodywork, subframe and underbody. These inspections must be carried out at the mileages stated on the Warranty & Service Sheet and at least once every two years. 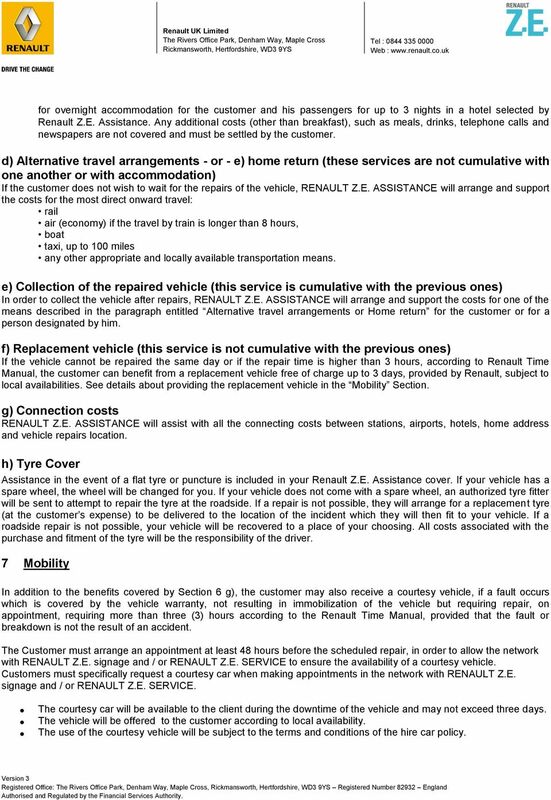 The periodic services within the RENAULT Network include these inspections. In the event of the customer requesting the Anti-Corrosion inspection carried out other than during the periodic service, the resultant costs for this inspection will be payable by the customer. At the time of these inspections, the customer will check that the professional who has carried out the operation has properly filled in all relevant anti-corrosion and subframe check coupons, thus validating the Anti-Corrosion Warranty procedure. The customer shall arrange for repairs to be carried out as soon as possible. Important Points to Note: - The Warranty does not apply and RENAULT and the RENAULT Dealer Network are not held responsible when: - The Vehicle has been used under conditions that do not conform to those stated in the Owner's Handbook, the Warranty & Service Sheet and these Warranty Terms and Conditions (for example: overloading or the vehicle has been entered in any sort of sporting competition). - The fault recorded relates to the fact that the Vehicle has not been repaired, maintained or serviced to the standard recommended by RENAULT. 9 - In return for the replacement parts fitted by RENAULT under the Warranty, the part(s) replaced within the scope of the Warranty rightfully become the property of RENAULT and the part(s) may be retained by the Dealer. All parts and labour services supplied under the Warranty are guaranteed under the terms of the Warranty until it expires irrespective of when during the Warranty period any parts and/or labour services are supplied Transfer of ownership of the Vehicle - Transfer of ownership of the Vehicle does not alter the terms and conditions of the Warranties. Terms & Conditions Operational Leasing BYD Europe b.v.
FAQ s. 1. How do I benefit from an Operating Lease? FAQ s 1. How do I benefit from an Operating Lease? No blocking of capital for non productive assets Tax saving option, Cash in Hand goes up with CTC remaining the same. Outsourcing the total Risk and Administration.